Google's release of the new open source, royalty-free WebM video format and VP8 codec is big news today. Brightcove is enthusiastically joining Google, Mozilla, Opera, Adobe, and others in pledging support for WebM. Our COO and CTO are on stage out at Google I/O to tell the crowd what we're up to. As you will see below, we believe that WebM is changing the landscape of online video in important ways that you'll want to understand. Before we get into the broader industry impact, I want to clarify what this means for Brightcove customers. In the future (we're still working on a specific date), customers will be able to upload video source files to us and we will transcode them into multiple rendition sets in both the H.264 and WebM formats. These rendition sets will be available for use in both Flash and HTML5 video experiences, and we'll help deliver the best possible experience given the capabilities of the viewer. A screencam demo of what this could look like is included below. There are three fundamental approaches to delivering online video experiences today: Adobe Flash, HTML5, and native mobile apps. Flash can display video encoded in multiple formats (primarily On2 VP6 and H.264) and is available on 99% of all desktops and will soon be available on nearly all smartphone platforms except those created by Apple. HTML5 can also display video in multiple formats (primarily Ogg Theora and H.264) and although it's available on a growing but minority percentage of desktop Web browsers today, it is is pretty much the only way to deliver video in a browser on Apple devices like the iPhone and iPad. Mobile apps are native software applications designed to deliver a video experience on smart phone platforms like Apple iPhone OS, Android, RIM Blackberry, Symbian, Palm, etc. Today, most Flash video experiences, including those delivered by Brightcove on behalf of our customers, utilize the H.264 format. H.264 also dominates today's HTML5 and mobile app video experiences, primarily because it is the only option on the hot iPhone and iPad devices. H.264 is based on technology contributed by an intellectual property consortium of vendors called MPEG-LA, and it provides outstanding quality. The only problem with H.264 is that there have been concerns about potentially large royalty payments associated with its online use. These royalty concerns have been pushed out to at least 2016. However, the possibility of substantial royalty liabilities continues to hang like a cloud over the H.264 standard and prevents browsers like Mozilla and Opera from adopting it. Until WebM, there was no alternative to H.264 that was free and of sufficient quality to become pervasive across Flash, HTML5, and mobile app video experiences. Ogg Theora is free, but suffers from quality and efficiency concerns that make it a weak contender. WebM incorporates the well-regarded VP8 codec that Google acquired with its On2 Technologies deal last year. And now that the technology is open sourced under a royalty free Mozilla license, WebM has become "both free and good" format that has been missing from the market. One of the primary factors that makes WebM so compelling is Adobe's commitment to support it in future versions of Flash. Adobe has an umatched ability to rapidly install new Flash versions on the vast majority of the world's desktops, and soon most non-Apple smartphones. New versions of Flash Player take about 18 months to be installed on 90% of all desktops. Having WebM in Flash will dramatically accelerate adoption by providing a huge available market of WebM-capable machines. WebM will also change the HTML5 video landscape as leading browsers build in support for it. The lack of a strong free video format with broad browser support has been holding back HTML5 adoption. Now, Chrome, Firefox, and Opera are all slated to support HTML5 video with WebM. Microsoft appears to have left the door ever so slightly open to supporting another video format in Internet Explorer as long as the format is secure and legally sound. Given their ownership of 50% of all desktop web browsers, Microsoft is in a pivotal role to drive WebM adoption. I am hopeful that they will find a way to support it. UPDATE: Microsoft has said that they will allow users to separately install the VP8 codec in IE, but have stopped short of shipping it with the browser. Browser version upgrades take longer that one might expect because old browsers die slowly. So it may take a while for desktop browser experiences built on HTML5 and WebM to become mainstream. However, developer enthusiasm for HTML5 is there, and now that the technology stack is ready, we'll see more and more HTML5 experiences on the Web. So what about WebM on devices? Because of battery life concerns, video on devices is all about chip level acceleration. While I don't have any details to share, the word I'm hearing is that chip manufacturers are very interested in WebM for the same "free and good" reasons that everyone else is. A lot of manufacturers already have H.264 licenses and have embedded the technology into a wide array of devices. But over time, we are likely to see a new crop of WebM capable hardware that will give H.264 some healthy competition. A smartphone or connected TV running both in-browser and native app video experiences with WebM could be in your future. One key remaining question is how Apple will approach WebM. 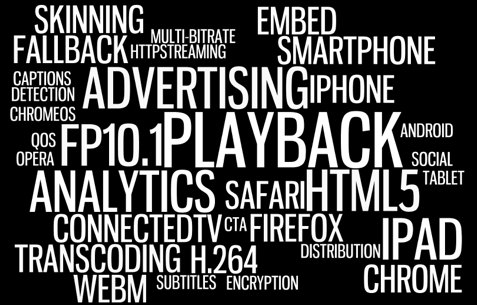 Apple is an MPEG-LA member, and has deeply adopted H.264 across their tools, operating systems, and hardware. Apple is showing huge growth, particularly in mobile devices, and has more than enough brand and market power to strategically steer technology adoption to suit their business goals. I hope they will welcome WebM, but even if they don't, the format is likely to see broad adoption elsewhere. Based on what we know today, it seems that WebM is well-positioned to become a strong alternative to H.264 across Flash, HTML5, and native app video experiences on both desktops and devices. That's not to say H.264 is going away. Apple and other companies have a lot invested in H.264, it works extremely well, and the royalty concerns are not universal held. We're probably going to have two strong standards in the market. It will take a few years for WebM to reach its potential. Upgrading the world's Flash Player, browser, and hardware infrastructure will not happen overnight. There could be twists and turns as the formats duel for market share, patent rights, and developer hearts and minds. Even if one format ends up with a minority share, it may be big enough to command attention from publishers. For the foreseeable future, customers will need to rely on both H.264 and WebM formats to reach the maximum possible audience with the best possible experience. This multi-format world will create headaches for customers who take the DIY approach to online video. These customers will need to manually generate and manage multiple formats for every asset, develop and maintain multiple playback experiences, not to mention figuring out how to do advertising and analytics across the different technology. We've already seen the first wave of publisher anxiety surrounding the introduction of the Flash-less iPad, and the landscape will continue to diversify as WebM becomes a substantial player. The good news is that Brightcove can help. Our customers rely on us to help them avoid cost and complexity, and we're stepping up to the challenge. 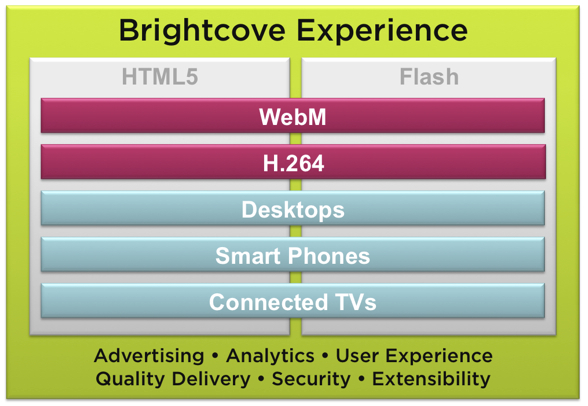 We're building a future where the Brightcove Experience is available across HTML5, Flash, and mobile apps with support for both H.264 and WebM formats. We hope to help customers avoid risky either/or bets and allow them to focus on their business strategy for video without having to worry about the technology. Hopefully, the end result will be video that just works. That is the way it should be.